You Thought We Were Nasty Before?!? "She Won"? No she didn't. If she had, she would be the president. The United States is not a direct democracy; it never was and never meant to be a direct democracy. It is a republic, a representative democracy - that is when and if elected officials actually represent the interests of people. By that criteria, the United States is more an oligarchy. The "nastier" we the people get, the more the United States resembles a democracy. 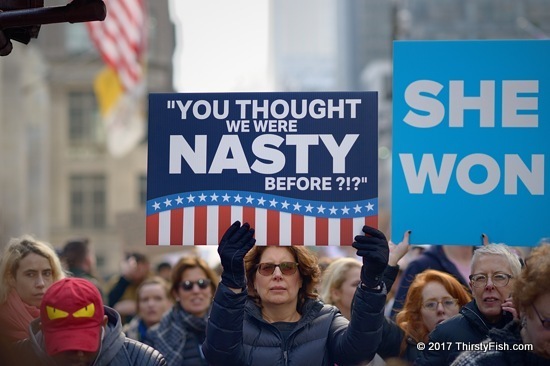 We are nowhere near "nasty" enough and we were not that "nasty before". President Obama seduced many of us with his eloquence while he went on with his corporatist agenda. We didn't speak up. He left President Trump with all the infrastructure to further corporatism. Throughout her presidential campaign, Hillary Clinton vowed to continue and "build on" President Obama's legacy. The idea that "she" was some sort of a savior is absurd. But agreed, let's get nasty!